February is a good month. It’s short. It brings us many holidays: Groundhog Day, Abraham Lincoln’s birthday, Valentine’s Day, George Washington’s birthday and Presidents’ Day, combining both George and Abe. And it’s the next-to-last stop on the way to spring. And it brings us Annapolis Restaurant Week. 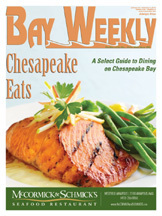 From February 15 to 21, 34 Annapolis restaurants serve us their best at bargain prices. Lunch is $15.95 and dinner $29.95, the same prices as last year. For that price, you eat not only the best but also three courses of it: appetizer, entree and dessert. Many restaurants open their whole menu to Restaurant Week customers; others showcase specialties. So you get a greater range of experience for your money. 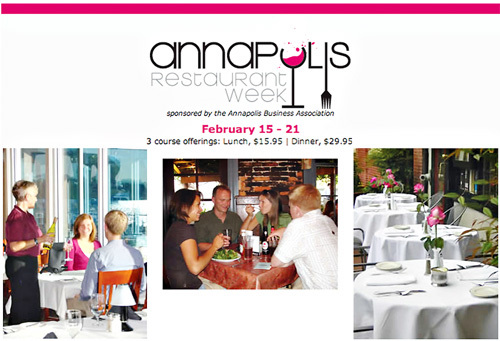 Not only is Annapolis Restaurant Week a bargain, and not only is it a celebration. It’s a local, bargain-priced celebration. “As it’s an Annapolis Business Association-run program, the focus is on downtown Annapolis,” says Erin McNaboe, vice president of Rams Head, one of the participating restaurants, and chairwoman of Restaurant Week. 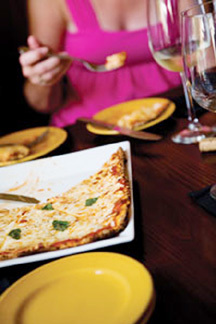 Annapolis Restaurant Week invites us to get to know our capital city by digging into its culinary range. You could walk your way through Annapolis Restaurant Week. That’s how densely packed is the city’s historic center, where about half the participating restaurants are located. A few, grandfathered in because of their participation in last year’s inaugural event, are out of walking distance and even city limits. 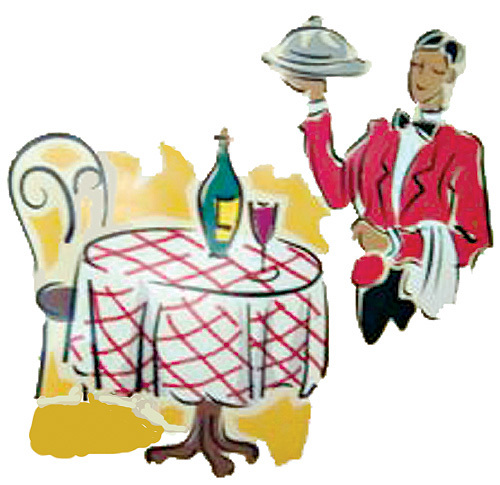 Events like Annapolis Restaurant Week do more than give restaurants a boost in a low season and cheer up February. They give us good value, widen our experience, teach us our communities and make more sophisticated customers and better restaurants. That’s why restaurant weeks have flourished across the country. Annapolis Restaurant Week is an opportunity that knocks only once a year. Miss it this February, and it will be 2011 before you can again walk through the doors of these 29 Annapolis restaurants  including three new ones, Hell Point, Level and Latin Quarter  and sit down to their best offerings at bargain prices. So make your reservations early. In your plans for eating well, include bringing a few items of non-perishable food for Restaurant Week’s drive to feed the clients of We Care & Friends and the residents of Light House Shelter. Forget fancy foodie terms like fusion and nouveau. 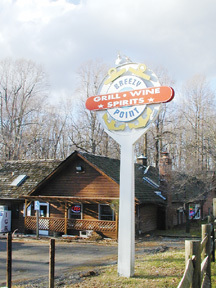 At Breezy Point Grill, it’s all about feel-good comfort food. On the corner of Rt. 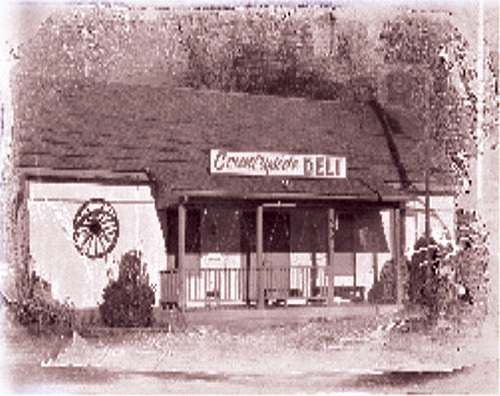 261 and Breezy Point Rd., this local favorite will feed you breakfast, lunch and dinner the old-fashioned way. Start your day with a hearty country breakfast of ham, eggs, pancakes, French toast, omelets, sausage gravy and biscuits. Or grab a breakfast sandwich on toast or English muffin. Deli favorites reflect the maritime spirit of Breezy Point: The High Tide, Keel Dragger or Center Console. Hot off the grill are steak and cheese subs, hamburgers, half-smokes and the Big Tom  two grilled beef patties with cheese, lettuce, tomato, onion and special sauce on a triple-decker bun. Eat too many of these, and your boat may not make it out of the slip. Dinner selections feature favorites like country-fried steak, fried chicken, pork chops, hot turkey sandwich with mashed potatoes and gravy, or rockfish and chips. Side dishes vary daily, in the range of collard greens, mac and cheese, green beans, cole slaw and potato salad. Grab any of it to go, or eat in at one of the Grill’s six café-style tables. On special nights, stick around for wine tasting. Bienvenue à Café Normandie, a family establishment whose fusion of French country cuisine and Maryland seafood has made it popular in Maryland’s capital for 17 years. Here the atmosphere is refined, relaxed and romantic, and it’s one of the few Certified Green restaurants in town. Even the mineral water is filtered in-house. The $24.95 three-course Early Bird Menu serves heaven on a fork, starting with an endive salad with beets, walnuts and Roquefort that’s fresh, harmonious and plentiful. The Chilean sea bass, lightly crisped on one side and served with squash julienne and fresh figs, is reminiscent of the film Julie and Julia, because “everything tastes better with butter.” Not that this food needs any help, but butter is everywhere. Still, there’s none of the heaviness of overindulgence. The chocolate éclairs taste like an Acadian heirloom: the same crispy, light shell and dense egg custard. The wine complements the meal. Proprietors Jean Louis and Suzanne Evennou strive to offer “a price for every purse,” says Jean Louis. But to fully appreciate his menu, a couple should expect to spend at least $100 for a three-course dinner with wine. Sample the same entrées at lunch, though, and save big. Weekend breakfasts, 9am to noon on both Saturday and Sunday, (priced $9-$15, is mostly American fare with such French touches as brioche, croissants and a crepe. Other deals worth waiting for include half-priced wine Wednesdays, a monthly wine tasting dinner (typically the first Tuesday of every month, the next on Feb. 2), jazz nights beginning Jan. 28, and a four-course Valentine’s dinner with champagne for $73 per sweetheart. A visit to Benedict always feels like a journey. Not that the Patuxent River village is so far away. It’s only 13 miles west of Prince Frederick. But it is a village time forgot. Eastern Charles County along the river is still pretty much open space, with farms and vistas not entirely different from when Capt. John Smith passed this way in the early 17th century. Cap’n Randy’s  opening Feb. 10 in the former River’s Edge  promises its own sense of history. Call it family feeling, for this is the kind of place people used to gather when Southern Maryland was rural, not suburban, and before chain restaurants colonized the area. It’s a relaxed place, its atmosphere laid back. “You’re not a customer. You’re a friend,” says owner William Stewart. It also has a view. You can’t avoid waterfront dining at Cap’n Randy’s. In warm weather, the outside deck takes you even closer to the water. For another seating option, bring a party. The banquet and meeting room is available at no charge. Cap’n Randy’s opens with an honest, no-frills menu of steak and seafood, Maryland crab cakes with no filler and all-you-can-eat specials Wednesdays and Thursdays. The cream of crab soup is the chef’s pride. And you won’t want to miss the signature dish, fresh-made jumbo hush puppies. Maryland wines finish a full bar. So you’ll be well served at the Cap’n’s daily happy hour: 11am-5pm. 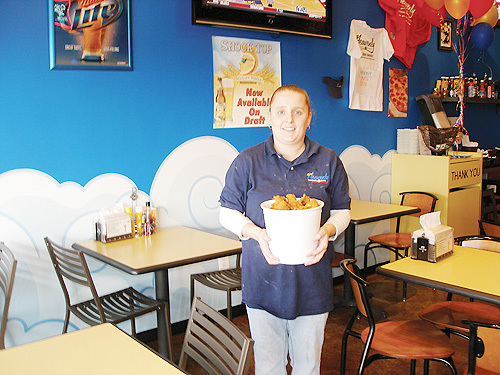 Tucked into the Country Plaza strip mall in Dunkirk, Chesapeake Grille & Deli is a pleasant surprise. The comfortably bright and spotlessly clean eatery is more than you might expect from the storefront. The menu offers a wide variety of choices, all cooked to order. Whet your appetite with peel-and-eat shrimp, fried oysters, jalapeno poppers or fried green beans. Regulars rave about the cream of crab soup. Entrees range from deli sandwiches piled high with Boars Head meat to chicken pot pie to grilled tuna to rib-eye steak. Wash it down with a cold soda, iced tea or bottled beer. Place your order at the counter and let the friendly wait staff take it from there. They’ll deliver your meal to your table and check back with you to make sure everything is okay. The service is excellent, but hold off on the tipping. As posted signs point out, tips are not accepted. In addition to donated tips, the restaurant works with local food banks, helping them procure food at wholesale prices. Chesapeake Grille & Deli also caters. They’ll come to you and do all the work, preparing everything from chili dogs to grilled salmon, in your kitchen or in their mobile kitchen. Step inside and step back in time at this neighborhood favorite with the ambiance of an old country store. That’s what owners Robyn Day and Michael Griffin want. Today it’s a great place for a hearty meal. Or a piece of homemade pie. Pull up a stool to the new, polished cherry counter and make a selection from the menu or the daily specials posted on the chalkboard. Country-style breakfasts include eggs, chipped beef and sausage gravy. Deli sandwiches and subs are served alongside liver and onions, grilled pork chops or the special of the day, like prime rib or New York strip. This unassuming little eatery exudes a community spirit you can touch. On the wall you see a monthly calendar filled with events: Karaoke night, Dark Sunday, National Hugging Day and a calendar full of other days. Furnished simply, Heavenly offers a broad menu based on chicken and ribs, plus a variety of pizza, seafood and sandwiches. You’ll get your order quickly enough, and your palate will be well served. But you may tarry as long as you like, over wine or beer if you wish. Heroes Pub is a classic sports bar. 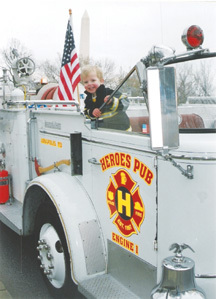 Everything about Heroes  from its dark blue walls and dimly lit booths to its arcade games and wooden bar chairs to the firemen’s hats and trophies adorning the walls  makes you want to have a beer. For that, you’ve come to the right place. Forty-eight drafts are lined up against the wall  plus a long list of exotic micro-brews, American favorites, even Pabst Blue Ribbon. During lunch on weekdays, Heroes is crowded. Prices are right on appetizers, salads, lots of sandwiches and a few full meals including, of course, crab cakes. But fundraising nights show the bar at its best. “We started out trying to support local heroes  teachers, doctors, nurses. Then the firemen sort of took over,” says owner Lila Beall, clearly proud of the Heroes she and husband-partner Kurt Beall have created. With its lush landscaping and Bayside setting, Herrington on the Bay invites your next celebration, whether it’s a grand wedding, a beachside picnic, a family reunion, a Hawaiian luau or a business retreat. “We want you to have an extraordinary experience in a natural setting that’s relaxed and elegant,” says owner Anna Chaney Willman. 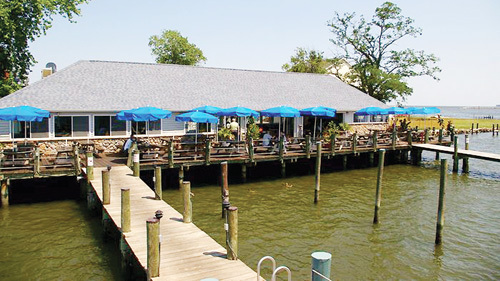 Herrington on the Bay also takes the party on the road, bringing relaxed and elegant Chesapeake cuisine to whatever setting you choose. Cooking classes bring you into Herrington’s kitchens with Pastry Chef Tom McReynolds to master the mysteries of bread. Sign up early for gluten-free baking on Feb. 7 (10am-12:30pm) or wheat bread baking Feb. 28 (noon-4pm). Wearied of another long, uncomfortable Maryland winter? How about dinner in Spain this week, or a long lunch in Mexico? With sweeping murals of a gentle countryside and service that is as elegant as it is efficient, Jalapeños is dedicated to taking you on a gourmet’s journey. With its mastery of the classical cooking of Spain and old Mexico, the restaurant has been a mainstay of cosmopolitan dining in Annapolis for more than 10 years. Do you have an urge for adventure? Instead of Jalapeños traditional (and quite excellent) lunches or dinners, try traveling through their extensive repertoire of tapas and antojitos. These small portions of delectable treats could start you on a seaside journey in Spain with a ceviche of shrimp, scallops and calamari seasoned in olive oil, garlic and cilantro. Cross over an ocean to a Cuban-style empanada (stuffed pastry) featuring a beef and pork filling seasoned with green olives, raisins, aji, tomatoes and white wine. Continuing on across the Caribbean into Mexico, experience chuletitas  little lamb chops with sautéed onions, tomato and pimento. Tarry in Mexico with more delicious decisions or return to Spain: It’s your adventure to direct. Co-owner Gonzalo Fernandez has directed Jalapeño’s since its inception in 1999 toward the same goal: consistency and perfection. Happy hour is 4-6pm weekdays, 4-7pm weekends with $5 tapas and special prices on beverages and other treats. Annapolis’s newest restaurant comes from the dynamic duo who’ve shaken up our culinary landscape over the past decade by introducing three creative restaurants  Tsunami, Lemongrass and Metropolitan. Gavin Buckley and Jody Danek have extended further by tripling Lemongrass (locations on West Street and Housley Road in Annapolis plus Crofton). After a detour to Baltimore, they’ve returned home with a new concept  and a new identity for the old Metropolitan. After leasing the Metropolitan space to Jerry’s Seafood for the past two years, Buckley and Danek have reclaimed it (and the boutique next door) and are feverishly revamping it as The Latin Quarter. Painting and construction are still under way, but expect bright interiors with walls painted yellow, orange, green and magenta. A departure from the Pan Asian fusion and Thai menus that have made their restaurants so popular, The Latin Quarter will feature California-Mexican food with strong Latin influences. While menus are not yet finalized, expect fish tacos, ceviche and skewered meats and fish (anticuchos), along with family-style sides including plantains and dirty rice. Cocktails will continue the theme with fresh mojitos, margaritas and caipiriñhas. Taking advantage of the roof-top bar, Buckley plans a tequila bar and club. Doors to The Latin Quarter will open early Feb. 8, just in time to see and taste for yourself during Annapolis Restaurant week. Luna Blu Ristorante Italiano continues to win fans with authentic Southern Italian cooking, intimate dining space and a relaxing pace. While formal by white tablecloth standards, Luna Blu maintains a familiar vibe with neighborly hospitality. For lunch and dinner, choices range from a slice of hand-tossed pizza to escargots in puff pastry to fresh pasta with one of many homemade sauces, to rustic veal, chicken or seafood. A lengthy wine list offers a generous selection and price-range of Italian wines. For the exceptional deal, visit on a Monday or Wednesday night and take advantage of half-priced bottles (some exclusions). Here and at sister restaurant, Rustico in Stevensville, a prix-fixe four-course meal is served nightly for $35. 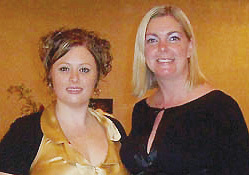 Co-owner Erin Dryden suggests reservations, especially for special evenings such as the upcoming Valentine’s dinner. That lovely menu includes Champagne risotto with lobster, crabmeat and shrimp; and sacchetti con gorgonzola and pears. 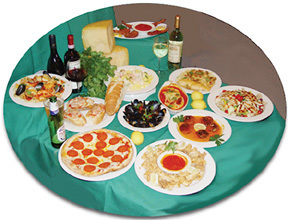 Mamma Lucia has been serving a taste of Italy to Calvert County since 1997. At both the original Dunkirk location and the newer Prince Frederick location, comfortable dining rooms with oversized booths encourage you to settle in for a leisurely meal. 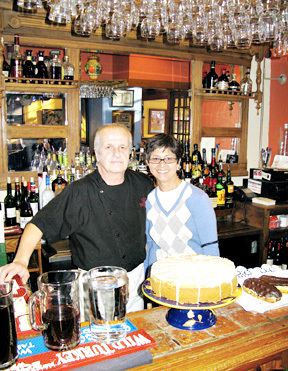 Owners Sal and Maria Lubrano want you to feel like extended family. They greet you and feed you generous portions of fresh pasta, pizza, veal, seafood and chicken from recipes inspired by southern Italian and Neapolitan traditions. Mamma Lucia specializes in “typical Italian recipes,” says Maria Lubrano. At the same time, the Lubranos strive for innovation. “A lot of dishes we come up with. We try them and then we put it on the menu,” she says. The most popular is the Bowtie del Mare: lobster, crab and asparagus in a light cream sauce. Regulars know to ask for a bowl of olive oil to accompany the basket of fresh-baked bread. For pizza lovers, Mamma Lucia offers three types: Sicilian, stuffed and New York. The 16-inch gourmet pizza is a vegetarian’s delight. Don’t try to eat it with your hands; it takes a knife and fork to handle this pie, heaped with broccoli, spinach, tomato, mushrooms, peppers, artichokes, olive oil and extra cheese. If you still have room, dessert is Italian-American: tartufo, cannoli, tiramisu, spumoni, Mississippi mud cake, caramel apple pie and triple chocolate cake. The bar is stocked with Italian wines as well as beer and liquor. Bay Weekly readers have named Mamma Lucia a Best of the Bay winner. To bring Italy into your home, Mamma Lucia offers two options: Call in your order and pick up for a to-go taste of Italy. Or call Mamma Lucia’s catering service: 443-486-4701. In 40 years, McCormick & Schmick’s has made its name synonymous with seafood aplenty. By opening the world’s rivers, bays and oceans to our intimate experience, it has helped convert America to a nation of fish-eaters. From Jake’s Grill in Portland Oregon, the seafood chain has perfected its brand, spread up and down the West Coast  California alone has a dozen McCormick & Schmick’s Seafood Restaurants plus one McCormick & Kuleto’s  and across the nation, making plenty of stops in the West and Midwest on the way to the East Coast. Many cities  including Baltimore, Boston, Pittsburgh and Washington, D.C.  have two, often in slight variation, as a harborside restaurant, fish house or grill. Annapolis got its place on the McCormick & Schmick’s map two years ago, at Westfield Annapolis Mall. What has a West Coast eatery got to offer a city whose feet are wet by the brackish waters of Chesapeake Bay? “In Annapolis, people think we’re on the water. They call for a table with a view. Parking lot or mall? I ask them,” says Dean Havas, who transferred to the Annapolis McCormick & Schmick’s from Pittsburgh at summer’s end. For seafood eaters, the answer is simple: The rewards of culinary globetrotting without the demands. Because for all its scope, McCormick & Schmick’s helped reawaken America to the value of distinctness of place. Each day’s lunch and dinner menus identify the day’s catch  by fish and where it was caught. The catches change daily. The list includes at least four varieties of oyster every day. One day last week, McCormick & Schmick’s Annapolis was serving Fanny Bay oysters from British Columbia, Washington oysters from Willapa Bay, New York Blue Point oysters from Oyster Bay, Point Judith, Rhode Island, Salt Pond Select oysters, and Delaware Bay oysters from the Maurice River in New Jersey Sound. Also featured were rainbow trout from Buhl, Idaho, flounder and sea scallops from Georges Bank, Massachusetts, catfish from Aiden, North Carolina, salmon from New Brunswick, Canada, lobster from Boothbay, Maine and striped bass from Virginia’s Chesapeake. “The rockfish come in with the tags hanging out of their mouths,” Havas says. New Zealand, where Bill McCormick (yes, there is a real McCormick) served as America’s ambassador under President George W. Bush, is the current theme of McCormick & Schmick’s across the nation. The invitation to “join us on a remarkable exploration of New Zealand through the flavors inspired by this beautiful land,” is backed up with New Zealand green shell mussel fritters, shellfish stew and king salmon. Preparations are almost as varied as the fish. Fish tacos, wraps, burgers, club sandwiches and salads were among the choices on a lunch menu last week  as well as fried fish, fish with pasta or rice, fish soup and stew, and perfectly prepared steaks. Seafood is king at McCormick & Schmick’s, but its rule is not absolute. Beef, pork and chicken are plentiful as well, including, now, a New Zealand grass-fed filet mignon served Wellington style with a kiwi blue cheese onion tart. There’s a full bar menu, including fresh-squeezed juices and a large wine list. Happy hour is a bargain, with prices ranging from $2 to $5. 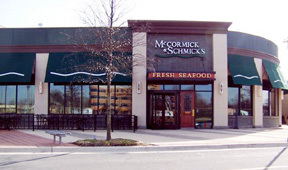 Whatever you eat, you’ll eat in comfort at McCormick & Schmick’s. Ambiance and comfort are as important, Havas says, as food. Longing for Chesapeake summer? Missing the smell of good Bay cooking and the sight of boats, water and gulls? Then Mike’s Restaurant and Crab House is the place to chase winter away. 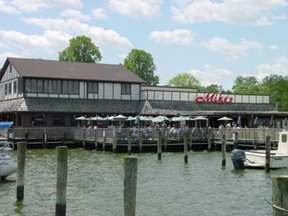 On the South River just off the Riva Bridge, Mike’s has been a Chesapeake tradition for over 55 years. This is a hometown crab house, and there really is a Mike  Mike Piera, whose four sons continue the family business in their father’s original spirit. “We make sure our customers are happy, give them quality food and try to bring in new generations ,” says son Arthur. Tradition doesn’t mean standing still. Blue crabs come up from Louisiana this time of year, but the Jimmies are still plump, sweet and delicious. The award-winning Maryland crab soup is heavenly. Rich, crabby and thick with vegetables that still have a touch of crispness, a bowl of this delicacy alone is enough to banish any hint of cabin fever. If you’re looking for a bigger seafood feast, the heaping platter of Mike’s broiled seafood combo features orange roughy, crab cakes, shrimp and scallops. Food from the sea not your yen? Mike’s succulent baby back ribs or tender, grilled U.S. prime New York strip are a carnivore’s delights. The South River view is daytime entertainment enough. Music adds to the nighttime fun on weekends even in winter, with karaoke every Friday. This is a restaurant that knows how to spoil you and your family, no matter how many of you there are. Mike’s seats about 270 inside, as well as another 200 outside on a deck that’s always full in summer. There’s room for your private parties upstairs, and more party room to come when Paul’s next door reopens as Michael’s on the South River. Guten tag! 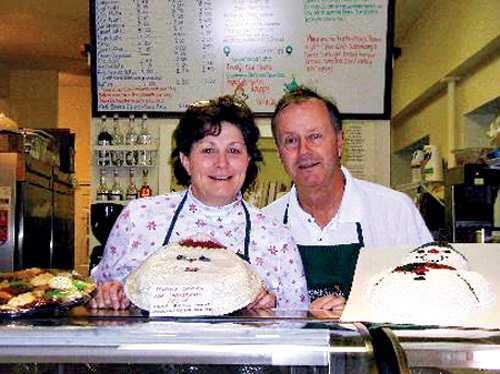 The Selinger family’s authentic German restaurant has welcomed guests with those words since 1983, when Karl and Ursula arrived from Germany and began their business serving the food they know best. Beer flows freely from ten taps, one rotated seasonally. Winter’s 10th tap often features darker beer, currently Spaten Bock, which literally translates to shovel billygoat. In the summer, wheat beers are more common, while fall’s Oktoberfest brews are in-between amber shades. Beer isn’t all The Old Stein does well. Popular year-round favorites prepared by Chef Dirk Dressen, who comes from Germany, include marinated beef sauerbraten served with red cabbage and a rich brown sauce over potato dumplings, and breaded pork tenderloin Jagerschnitzel topped with a mushroom-onion sauce. In summer, diners like small plates, seafood and salads. Cold temperatures bring heartier meals, and this time of year you’ll find a variety of game, including pheasant, buffalo, venison, wild boar and even an occasional kangaroo. Prices for entrees range from $16-25, while beers start at $4 and go up to $20 for a huge glass. There are also nightly specials. 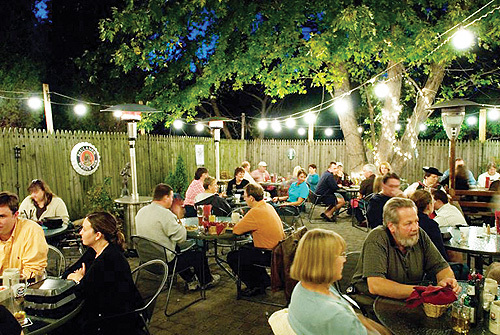 In the summer and fall, crowds fill the traditional outside beer garden, where you might hear from a strolling accordion player or a four-piece band. The garden offers communal-style eating at deck tables, while the inside is cozy and warm. Long before we moved here, my husband and I started coming to Pirates Cove with an aging aunt and uncle who lived nearby. It was their favorite place. They liked the food, the West River views and the special courtesy shown them by attentive and familiar staff. They are long gone, but we enjoy the same benefits, plus we look forward to the first warm day when we can kick back, relax on the deck and have a drink or two before an early dinner. Bob Platt, whose family has owned the restaurant for 25 years, says, “We have a lot of long-time customers and a lot of long-time employees. 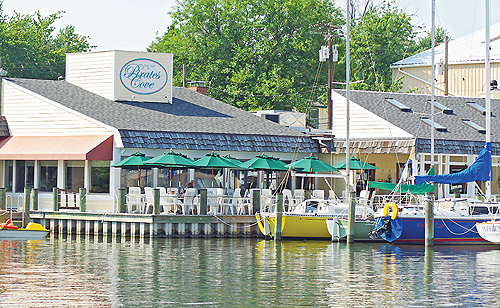 We’re like family, and we try to extend that feeling to the people who come here.” Pirates Cove also caters to sailors with a marina, overnight accommodations and a dock bar open during warm weather. As for food, there’s a menu of full-sized meals (many in the $20 range) and smaller plates, with seafood specialties, few meat dishes, appetizers and desserts. Pirates Cove still includes salad and warm bread with your dinner. “We offer a quality product, good value for a fair price,” Platt says. Not to be missed are the award-winning cream of crab soup and the monthly special, currently two kinds of shrimp, fried and stuffed with crabmeat, plus salad, vegetables and potato for $14.95. Pirates Cove keeps long hours, serving breakfast on weekends, lunch and dinner every day and offering dancing, usually to a combo, Fridays and Saturdays. It’s also a great place to cozy upbeside the fireplace in the louge. You don’t need to be a golfer to enjoy fine fairway fare at Renditions Players Grille. You might as easily be drawn by its out-of-the-way country location, posh pub food or wide-open vistas. Or by the dramatic walk-on action outside the big windows. That’s supplied by the players on Renditions’ 18-hole reproduction golf course, its holes modeled on those at courses that have hosted one of golf’s four major championships. 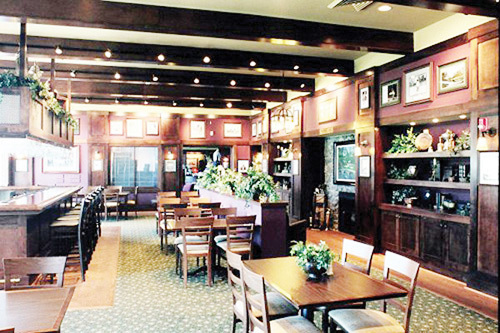 Players Grille serves upscale pub fare freshly prepared by expert chefs. The menu changes with the season to reflect what’s freshest, because shopping locally is par for this course. “In season I shop at farmers’ markets,” says assistant food and beverage manager Leon Fossett, who recommends the popular tomato-Gorgonzola soup. Discuss life and golf handicaps at spacious clubhouse tables, or warm up by the fireplace after a cold round. Catch your favorite teams on the Grille’s flat-screen TVs. Whatever course you play, Players Grille’s well-stocked bar is just the place to toast your success or drown your sorrows. You can make any ordinary day special at Rod ’n’ Reel. Weekend brunch makes it clear that chefs here love a challenge, and you won’t need to eat the rest of the day. At lunch and dinner, broad Bay views make you think fish, which you’ll find aplenty in original as well as standard preparations. Not that meat-eaters will be left out. Food is not the only way to make a special day at Rod ’n’ Reel. The tiki bar makes every summer day a celebration, and the resort hotel and spa made the Rod ’n’ Reel Resort a year-long destination. Feel lucky? Gamble as if slots were already with us in the gaming parlor, featuring electronic bingo. Feel fishy? Count down the days until April 23, when the nine-month-long charter fishing season makes Rod ’n’ Reel’s docks gateway to the Chesapeake. From making an ordinary day special, you can also depend on Rod ’n’ Reel to make your special days extraordinary. Summer festivities are unsurpassed fun: The first Thursday in August, the Celebration of Life Gala benefiting the American Cancer Society is summer’s best party. Fourth of July, Memorial Day and Labor Day each span three days with festivities. Grand as summer is at Rod ’n’ Reel, the party continues all year long. For Valentine’s, Rod ’n’ Reel has the setting for a night of romance. March 12-14 bring a Weekend to Die For, with an interactive bloodless murder mystery entertaining you from cocktails and dinner Friday through breakfast Sunday. Feeling ordinary? Go to Rod ’n’ Reel for the cure. 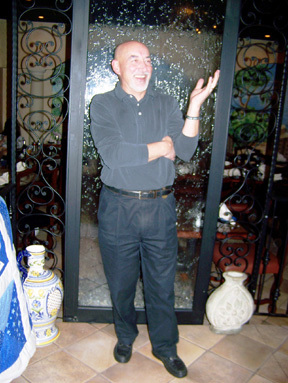 Founder Carlos Yanez, a native of Argentina, says his “passion for food and beer” called him to open a “fun, family-oriented restaurant.” Co-owner Michael Kelley is a 35-year veteran of the restaurant business and together with his wife operates The Brome Howard Inn, a bed and breakfast, fine dining restaurant and caterer in St. Mary’s City. 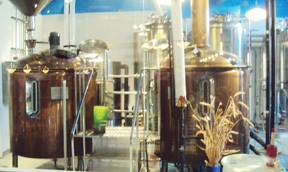 Yanez and Kelly combined their talents to open Calvert’s first and only microbrewery, The Ruddy Duck, in June, 2009. 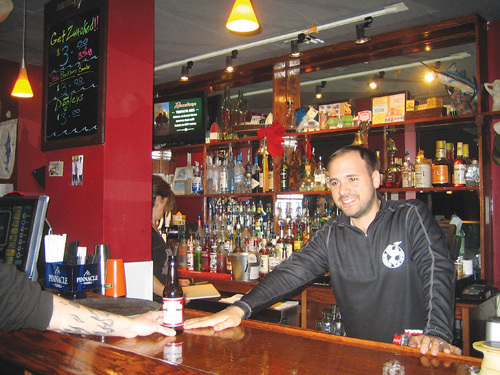 “We typically offer six to seven microbrews made on premises,” says co-owner Carlos Yanez. Just months after opening, the Ruddy Duck can boast gold. 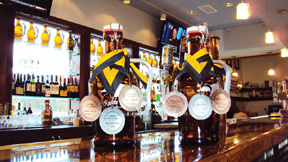 “Our Marzen, which is a pale lager, won a gold medal from Maryland’s Governor’s Cup,” Yanez says. Other regular offerings include Flag Harbor, a pale ale; Helles, a lightly hopped smooth lager; and Sandbar, an India pale ale. Ruddy Duck’s homemade brews go hand-in-hand with the homemade food  served with a twist. Specialty pizza like BBQ duck, wowie Maui and Jamaica jerk tempt more adventurous palettes. Ribs go international, braised with Argentinean chorizo and chimichuri sauce. Traditionalists will find plenty to choose from, with selections including pork chops, rib-eye steaks, burgers and oven-roasted crab cakes. Satisfy your sweet tooth with treats like bread pudding, pineapple pound cake or toasted almond cheesecake. Whatever your pleasure, the emphasis at Ruddy Duck is on fun. The two canoes hung from the high ceiling and colorful murals of carousing ducks, Ruddy’s Rowdies keep the atmosphere light. The dining room is large and lively. The long, polished wood bar was made by Amish craftsmen. Handmade tiles by Prince Frederick artist Parran Collery lend a colorful local accent. Bucking the trend of high-octane crab houses and waterfront tiki bars, Rustico Restaurant & Wine Bar has brought Stevensville a taste of Italy. Located in the heart of picturesque Love Point, Rustico offers fresh Southern Italian cooking in a warm and inviting atmosphere and a menu rich in fresh ingredients and robust flavors. Chesapeake variations on Italian themes include pollo o vitello all’ Annapolis, rockfish Meditteranean and green tomatoes topped with Buffalo mozzarella. Choose the casual wine bar for happy hour specials, light fare or the full menu. Or enjoy your meal in a cozy nook in the dining room. 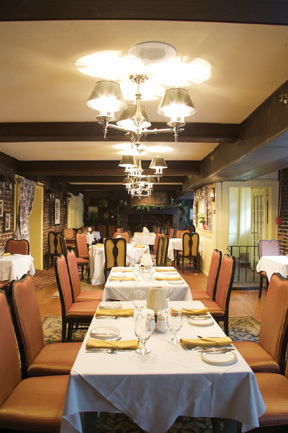 Wherever you sit at Rustico, you are sure to drink and eat the most authentic Italian food in the area. Maximize your indulgence with the four-course prix fixe deal for only $35. On Mondays and Wednesday most wine is half-priced. Bargains are served every day in the bar, in the form of half-priced food and drink specials. With an emphasis on fresh, Salsarita’s creates south-of-the-border favorites as you like them, as you watch. Build your burritos, tacos and quesadillas from your choice of chicken, beef, pork, shrimp and veggies. To complete your concoction, pile on toppings, like rice, beans, jalapeno peppers, red onions, black olives, lettuce, tomatoes, guacamole and sour cream. Not quite so hungry? Make up a taco salad and enjoy it with a cup of soup. Or nibble on some chips, salsa and guacamole while sipping a signature Salsarita’s frozen margarita at the cozy bar. Take a break from a busy day in comfortable booths by big windows, where you can watch the shoppers and library-goers pass by. Or have your Mexican original packed to go. Salsarita’s catering will also bring the fiesta to you. 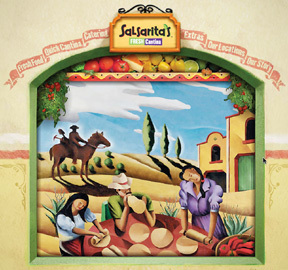 Find nutritional information for all menu items at www.salsaritas.com. Sam’s is the kind of place where you walk in and wonder why it took you so long to come. This fun local hangout has a little of everything you’re looking for. Great local acoustic music on weekends adds to the ambiance of a place already scoring high on that scale: It resembles a lighthouse overlooking Chesapeake Harbour Marina. “You will come for a drink and stay for an evening,” says owner Andrew Parks, grandson of Sam. A nationally recognized wine list supports that claim. A full martini menu and deep Scotch menu add spirit. Weekly specials seduce with bargains as well. Tuesday offers half-price Kobe burgers for lunch and dinner, and Thursday offers $8.95 pizzas. Wine is half priced on Wednesday night. Chef Jerry Trice (a graduate of the Culinary Institute of America, seasoned in D.C.’s Vidalia and Red Sage restaurants) makes food king at Sam’s. It’s gorgeous, savory and inventive, like an upright (as if swimming) whole fish of the day, crisp and garnished like a work of art. With an amazing view, Sam’s also offers an à la carte brunch. Order yours with a bottomless mimosa or bloody Mary. Saphron wins you over from the moment owner Charleen Obal opens the wooden door from the vestibule onto its intimate dining room. Within is a warm, saffron-tinted space and a small collection of smartly appointed tables. When the door to the kitchen swings open, your appetite is stirred by aromatic hints of the night’s menu. As you sit, you notice reading glasses placed at table’s center. Now that’s just nifty. Niftier still is the food. This gem of an establishment is a labor of love run by locals Charleen and John Obal. Their focus is on intimate fine dining, with an ever-changing menu of specials and seasonal offerings from local Amish markets and diverse ingredients from farther abroad. The chef’s lamb dishes are especially reliable. Experiment to your delight, though the mainstay signature southern lowland dishes inspired by Charleen’s Charleston, South Carolina, roots make for a hearty meal. 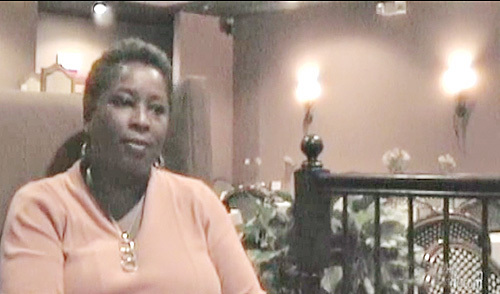 High among the signature flavors are Charleen’s own shrimp and grits. Embrace the starch and add a side of some of those marvelous sweet potato fries. Have a little French press coffee to complement Charleen’s heavenly bread pudding for dessert, and you’re sure to amble away happily into the evening. Or enjoy a honey-poached pear filled with caramel and served on a bed of crumbled phyllo. Meals here are a pleasure, and return trips are rewarded by a variety of experiences. Foodies will enjoy that the kitchen keeps its repertoire dynamic and focuses on quality rather than quantity; sensible entrée portions are satisfying yet leave room for more joy. Prix-fixe meals  such as the upcoming $70 Valentine’s feast  are eagerly anticipated special occasions. Meals are plated beautifully and delivered with friendly service. Large groups will have to exercise some patience, given the kitchen’s small size. A nice selection of wines is available at moderate prices by the glass and bottle. Calvert’s own Friday’s Creek winery is often represented. Beer drinkers will find a good bottled selection but no drafts. Entrees are fairly priced given the quality, but be ready to splurge a little. Main courses range from $15 to $25; sides hover around $6 and desserts are $7 to $8. If you haven’t heard of Skipper’s Pier by now, you’ve been living under a rock. Triple-winner of Best Restaurant, Best Dock Bar and Best Oysters for Bay Weekly’s Best of the Bay, this Deale harbor restaurant (and in summer, deck bar) is not just another South County joint. It’s a no-brainer choice for the hungry seafood-obsessed. But Skipper’s Pier offers more than bivalves and view. You won’t find a better place to eat locally caught $2 crabs on Tuesday nights or to taste dishes from seafood gratin to glazed fried chicken at the Friday night seafood (and more) buffet. But you only get one chance a month to try Kozik’s pairings of regional wines with your five-course meal. These monthly dinners are also good times to stock your wine cellar, for the vintages are offered to diners at wholesale prices. Skipper’s covers the territory between crabs and special dinners with its distinctive combination of Chesapeake and Southern cuisine, including such classics as shrimp and grits with collard greens. The warm weather draws a crowd to Skipper’s dock bar and picnic tables, but to keep you warm all year there’s a patio-style dining room and a cozy bar. Washingtonians and locals have long known about Skipper’s Pier. If you’re from one of the regions of Chesapeake Country that thinks Deale is the sticks, here’s a destination to change your mind. Smokey Joe’s Grill is a casual place where you can afford to have a good time three meals a day. Come early for hearty breakfasts and join the fishermen. Come later for bar fare including burgers, wings, ribs, chicken and barbecue. Most dinners come with two home-style sides, comfort foods like mashed potatoes with gravy, macaroni and cheese, stewed tomatoes, seasoned fries or potato salad. Daily specials include fried oysters on Saturdays. Prices are family friendly, with many entrees under $10 and specials sweetening the tab. Chicken, fried or barbecued, is $8.99 on Wednesdays; all-you-can-eat ribs are $17.99 any night. 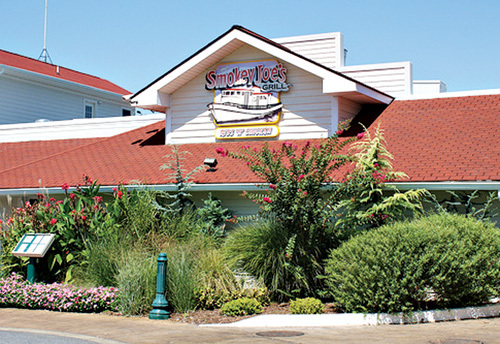 Special kids’ events team with prices to make Smokey’s a family-friendly destination. Desserts are another reason to eat at Smokey Joe’s: Apple fritters, apple cobbler, peanut butter pie, Snickers pie and cheesecake. Late weekend hours prove that Smokey’s has a lively bar scene after family hours end. One of the factors in the continuing renaissance of North Beach has surely been the 2005 opening of Sweet Sue’s, on the corner of Seventh Street and Bay Avenue. There’s nothing like a leisurely stroll into town when you can sniff the sea breeze and sip your coffee at a quaint wrought-iron table along with your choice of muffins, scones, cookies, cupcakes or brownies. Nearly all baked goods are made fresh on site. They range in price from $2.50 to $3.25 per serving. Sweet Sue’s also features soups, a couple of different quiches, sandwiches and wraps made from scratch. The latter are priced from $5.45 to $6.75. “We don’t use preservatives, so we’re dealing in small batches,” explains co-owner and general manager Gary Dzurec. “We used to make our salads in advance, but we found they were wilting, so now we make them on the spot.” Dzurec’s wife, the eponymous Sue, is CEO, supervising the kitchen and specializing in handmade cakes for weddings and other occasions. “Some people come for breakfast or lunch, and some stop by before we close to take home a slice of quiche and a salad for dinner,” Gary says. In warm weather, you can get handmade gelato, frappes and smoothies as well. Party platters with fruit, cheese and an assortment of baked goods and sandwiches are available to order, as are Sue’s sweet cakes. The Treaty of Paris comes by its name honestly. Its triangular flatiron building  now the Maryland Inn  stood at the corner of Main and Duke of Gloucester streets when the Treaty of Paris was signed. Eleven delegates of the 1783-’84 U.S. Congress stayed at the inn when George Washington resigned in Annapolis as commander in chief of the Continental Army and the Treaty of Paris  ending the Revolutionary War  was ratified. So if history draws you to Annapolis, follow it down into the cellar-level Treaty of Paris, where light falling into the embrace of brick walls and hardwood floors welcomes ghosts and legends. It’s easy to believe, and likely true, that Benjamin Franklin and John Adams drank, perhaps dined, here before you. Making modern history, the Treaty of Paris entered the Restaurant Association of Maryland’s Hospitality Hall of Honor in 2004. Cuisine  no surprise  is classic American. By that, manager Joe Dantoni does not mean the standard chicken, steaks and seafood of mid-20th century American history. 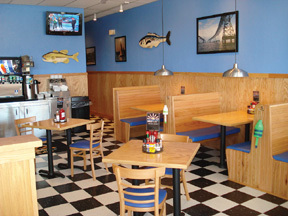 “Our specialty is seafood, especially such Chesapeake Bay favorites as crab and rockfish. Our beef is certified Angus. We use fresh local and organic ingredients in classic American dishes updated with today’s flavors and preparations,” Dantoni says. And it’s always a thrill to find the American classic popovers in your bread basket. An extensive wine list from California to Australia complements the menu. Spirits and beer are also served, and the bar, Drummers Lot, is an old pub. Most of the hours Treaty of Paris is open, you’re more likely to be drinking coffee than wine, however. Dinner is served only Thursday thru Saturday, from 5:30 to 9:30pm. Breakfast is served daily, for longer hours: 7 to 11am. Since opening in August, Waterman’s Tavern is building a reputation as an upscale pub serving quality, low-priced food in a relaxed atmosphere. It’s owned by cousins Ben, Jim and Phil Ricker, who have worked together for the last 10 years at their family-owned liquor store Londontowne Wine & Spirits, next door to the tavern. 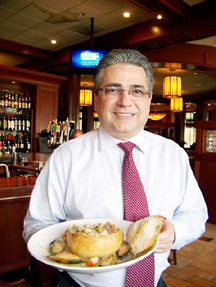 He attributes much of his tavern’s early success to Chef Steve Bridges, who has experience working in the kitchens of Fadó Irish Pub and Ruth’s Chris Steakhouse before helping Waterman’s become an Edgewater favorite. The cousins keep their “upscale pub grub” inexpensively priced  the most costly item is the house specialty, Rocko tacos (rockfish tacos), at $9.90. Appetizers, excluding seafood, are half-price Monday thru Friday 11am to 7pm, and there are a number of different specials each evening. Tuesday beer-tasting night is gaining popularity at $15 for all you can drink with the purchase of food. The selection? Any and all of more than 100 beers, mostly domestic, from Skull Splitter Orkney Ale to Rogue Dead Guy Ale. Both lunch and dinner menus offer lots of seafood, much purchased from local watermen. 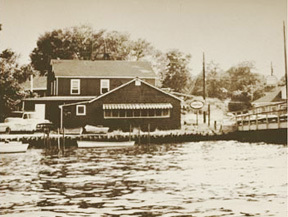 The name Waterman’s Tavern was chosen to recognize the locals who make their living off the Bay. A chalkboard of rotating specials hangs in the dining area. This week, the chicken liver and rockfish sliders are going fast.